The golden chandeliers of the Hall of Mirrors dripping with crystals, the 1.5km long Grand Canal stretching into the distance, the rosy pink marble of the Grand Trianon, and the hidden gems in the maze-like hedges… ladies and gentlemen, this is Versailles. The Palace of Versailles and its gardens are the biggest example of pre-revolution opulence you can visit. Forget the Louvre and the Tuileries garden. This is Louis XIV’s upgrade from the Louvre. This is the ultimate symbol of absolute monarchy. 20km southwest of Paris in the small village (now a wealthy suburb) of Versailles, this royal seat is designed to impress upon its viewers the sheer godlike wealth and power of the French royals. Nowadays it makes for the perfect day out from Paris! 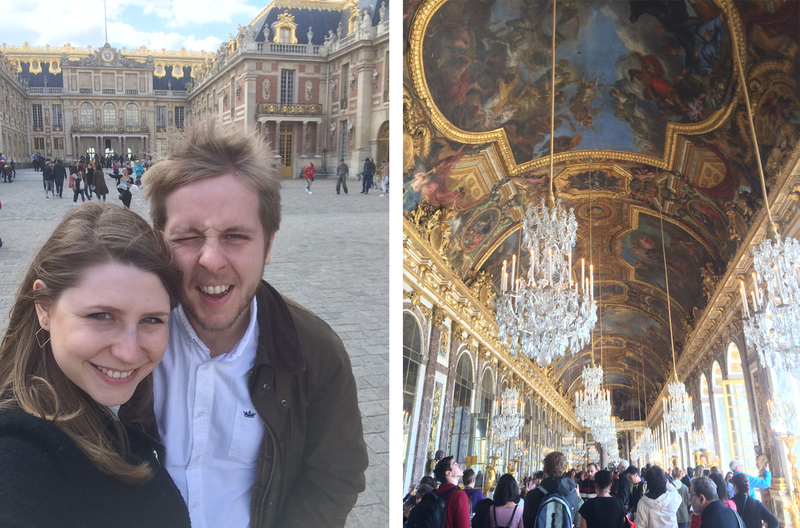 It’s actually super easy to get to Versailles with public transport. Line C of the RER (the RER is to the Metro what the London Overground is to the Tube) goes all the way out to Versailles-Château-Rive-Gauche from the centre of Paris. We were staying in the Marais so our best stop was from Saint-Michel Notre Dame. 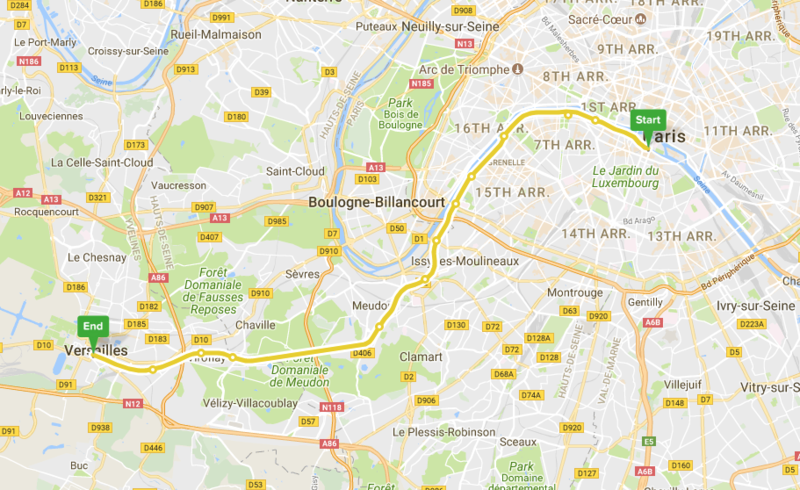 Line C from Paris to Versailles (Citymapper). The journey costs €3.55 and only takes about 45 minutes, and once you’re there it’s a 10 minute walk through Versailles to get to the Palace. Walking around all the gardens will rack your step count up into the tens of thousands, so make sure you wear comfy shoes! On our day there we walked 20,000 steps, and we didn’t even see everything. The walk from the station to the palace (Google). 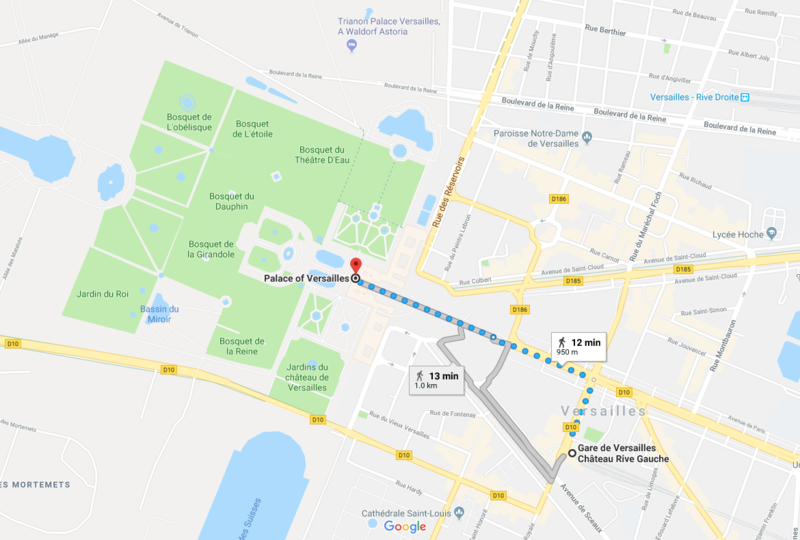 You can buy tickets for the palace from the Versailles Tourist Office which is on the left along Avenue de Paris as you walk from the station, or even better, book online in advance and skip the queue! A day pass to the whole of Versailles including the satellite palaces is €29.70 for an adult, but it’s free for all under 18s and free for EU citizens under 25. There are some cafes and restaurants in the grounds of Versailles, but to avoid getting ripped off I recommend you make your own sandwiches out of some nice fresh French baguettes, Emmental cheese and ham, to eat on the main steps in the gardens. On a busy summer’s day you want to leave the palace itself til after 4pm, otherwise the queues could take you literally hours. 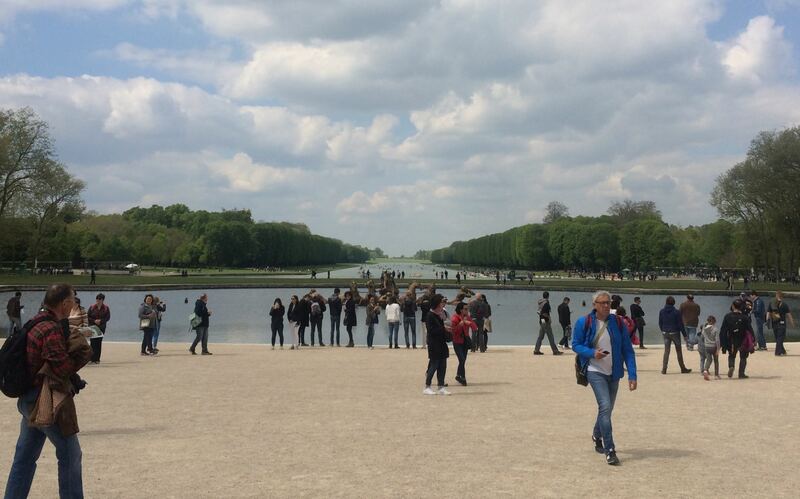 The view of the palace from the Parterre d’Eau, the gravel walkway between fountains. 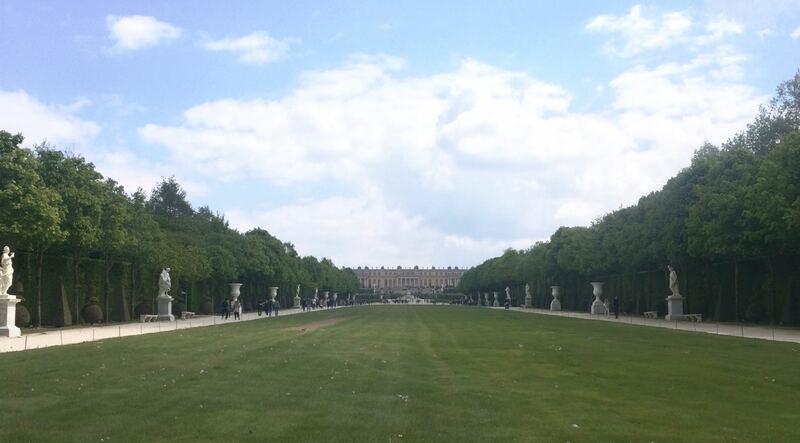 The Versailles palace gardens are a great place to start your visit! As you walk round the side of the palace, you’ll get a splendid view over the symmetrical ponds, baroque fountains and sculpted hedges, and out to the huge cross shaped Grand Canal in the distance. The sheer size of it all – 800 hectares in total, is slightly mind boggling. 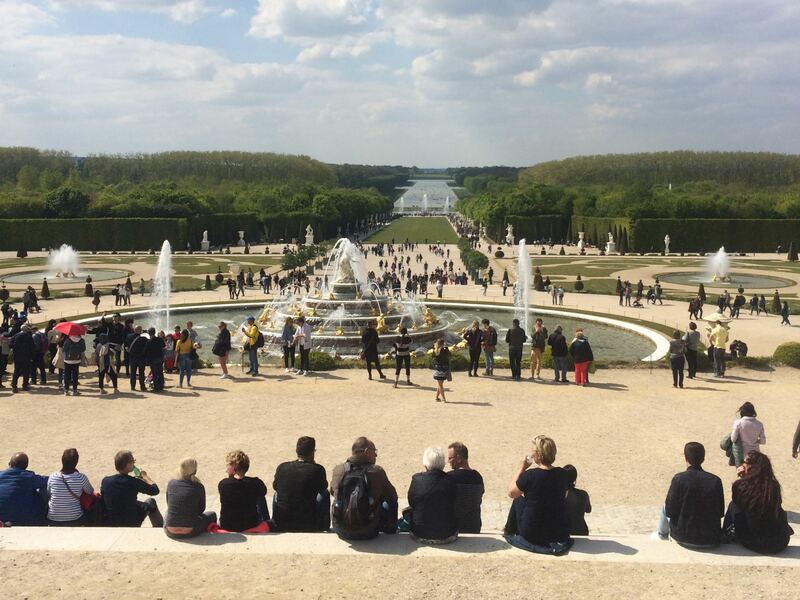 If you time your visit right you can catch the Grandes Eaux de Versailles, where they play music in time with the fountains. Tourists sat on the Escaliers de Latone admiring the Bassin de Latone. The gardens were designed to be viewed from the balconies of the palace, and there are lots of secret gems that you could miss. In the hedges to the south of the main stairs you’ll find the Bosquet de la Salle de Bal, an amphitheatre set into the earth. Mirrored on the other side is the Bosquet des Bains d’Apollon, with statues of Apollo set into the rock with waterfalls cascading down as though put there by nature rather than royal architects. The Allée Royale lined with statues either side of the tapis Vert. Also found in the hedges further along is the Bosquet de la Colonnade, a grand patio surrounded by columns to the south of the Tapis Vert (the huge strip of lawn connecting the Grand Canal with the palace), and to the other side is the Basin du Bosquet des Dômes, another column-tastic gravel patio. The tapis vert leading from the palace gardens to the Grand Canal. Once you’ve fully explored the gardens, it’s time to admire the char d’Apollon, the ornamental pond with a statue of Apollo the sun god on his chariot of horses, bursting through the surface to light the sky. The char d’Apollon fountain with the Grand Canal in the distance. 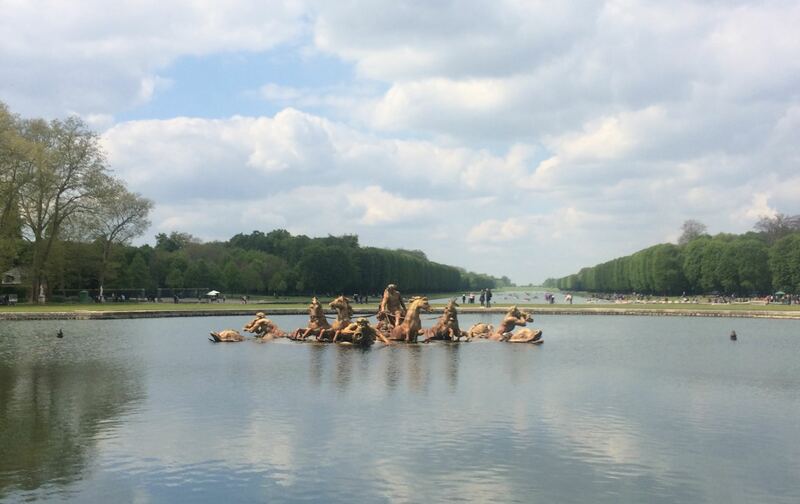 If you manage to time your visit for the Grandes Eaux de Versailles, this is the focus point of the show, with water spouting from the horses’ mouths. The char d’Apollon fountain, close up. The 1.5km long Grand Canal was originally used by the French royals for boat parties, but you can still hire paddle boats in the summer if you fancy a slow motion bumper car ride. The grass around it is a great place to pause and enjoy a cold drink or an ice cream from La Flottille. When you’re suitably recovered, it’s time to head up Allée de la Reine to Le Grand Trianon and le domaine de Marie-Antoinette. 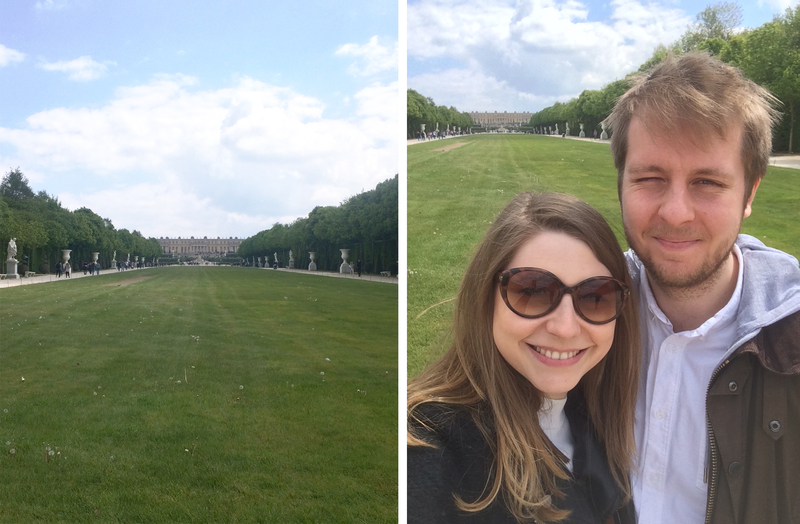 Grand Trianon and Petit Trianon are nothing short of cute compared to the Palace of Versailles. Built by Louis XIV for his family, the Grand Trianon is a charming pink marble building with Italian styling, covered in big glass windows to let in as much light as possible. 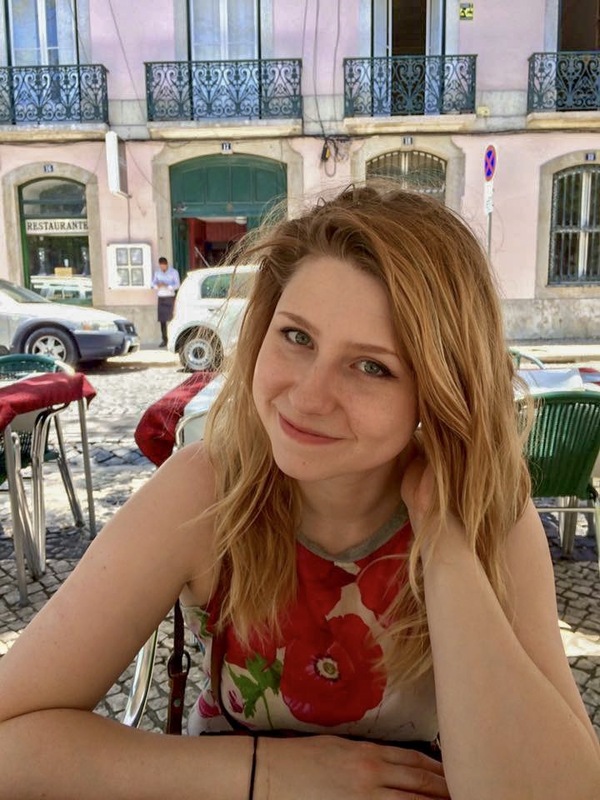 You can see why the royal family would like it, as it has a much more relaxed atmosphere than the palace, without any monuments to war or victory, and much softer more comfortable furniture and decor. The Petit Trianon is famous for housing Marie Antoinette. If you’ve seen the film with Kirsten Dunst (and I recommend you do, it will give you great context for your visit), this is where she escapes with her friends and pretends to be a normal girl, acting in plays and helping out on the farms. After all this you’ll probably be completely exhausted, especially on a hot day, so you might want to grab another drink by the Grand Canal before heading back to the Cour d’Honneur to join the queue. The Cour de Marbre and the Cour d’Honneur are separated by the Grille d’honneur. Left: Selfie in the Cour de Marbre. Right: The Hall of Mirrors or Galerie des Glaces. To pick out a few highlights, my favourite areas of Versailles that are worth plucking yourself up to appreciate are the Chapelle Royale, the Galerie des Glaces (golden chandeliers reflected by original Venetian mirrors – apparently the Venetians who passed on the secret to a perfect mirror were assassinated by the Venice authorities) and the Galerie des Batailles (French victories through the ages). 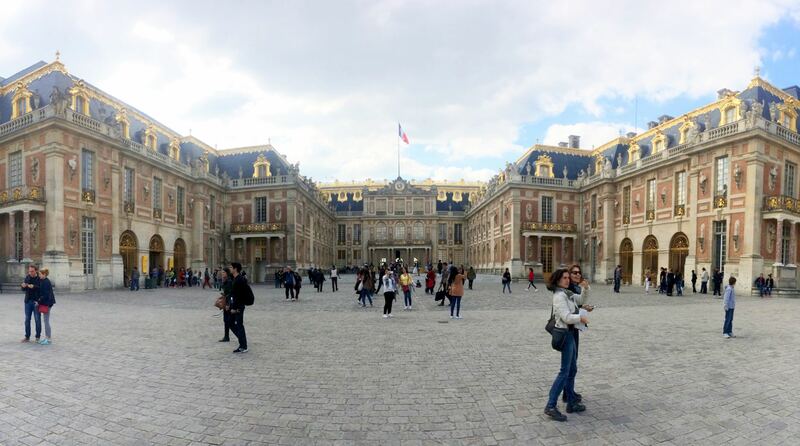 There’s nothing quite like the extravagance of the old French court, and nothing demonstrates it quite like Versailles. 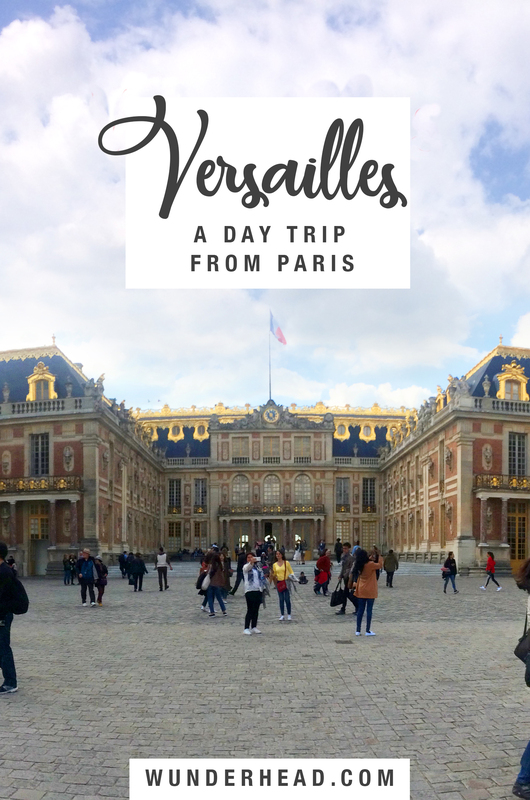 If you’ve been to Paris before and want to explore somewhere new, or if you’re in Paris for a week and can afford to spare a day away from the capital’s many sights, Versailles is a historically interesting and aesthetically stunning day out.